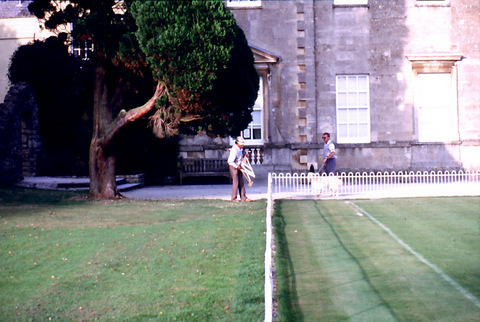 When Swindon Croquet Club was formed, back in 1985, this was our first Club Room at Lydiard Park where we had one Lawn. No; unfortunately not the big house, we were not allowed in there, in the rain we had to shelter under the fir tree in the background. 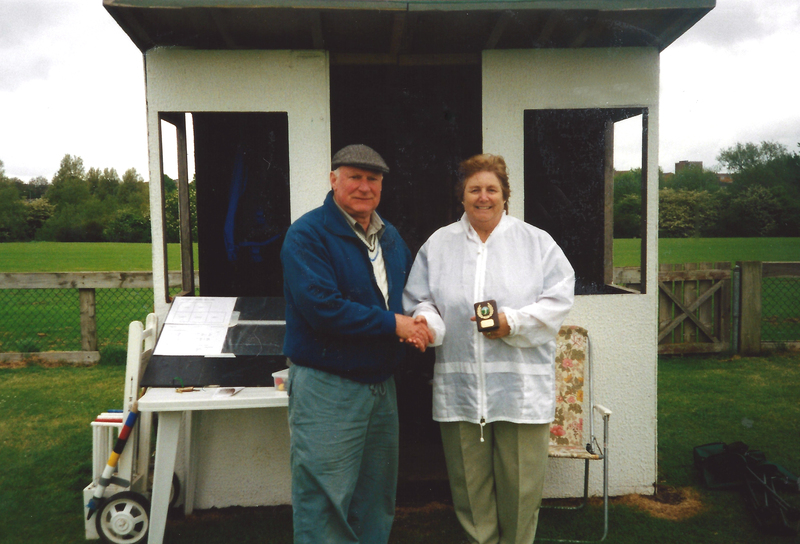 In 1996 we moved to Moredon Playing fields and our second Club Room had a roof but no glass. It had to be dismantled at the end of each season until it met its demise in 2002 when vandals drove a digger through the lawns and destroyed the Club Room. 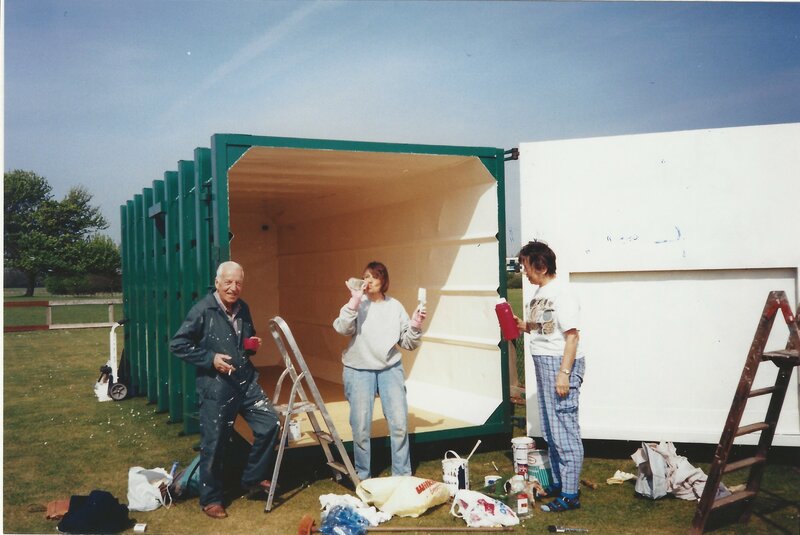 April 2003 saw the arrival of Club Room number 3, affectionately known as ‘The Green Room’. A lot of hard work converted the tip container into a usable space. In 2006 it was updated to store all the equipment with a little area to sit. 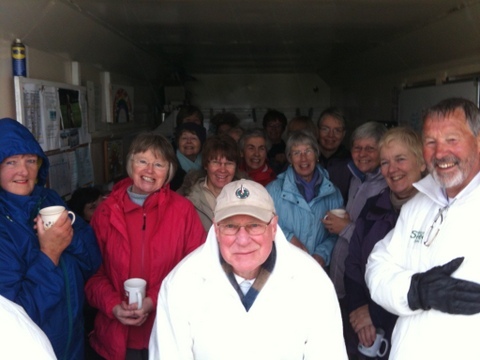 On wet days the community groups were packed in and the coaches stood at the front to protect the visitors from the rain. In 2011 came the Swindon Borough Council Financial Review which meant in order for the club to survive it had to undertake all its own lawn maintenance which had previously been done and paid for by the council, from the rent we paid. So that meant we needed equipment, and that would have to be stored somewhere – in the Green Room, which would mean we had nowhere to sit and shelter. Club member Neil Morrison, who had run his own architectural design company before retiring, came up with a plan for a new clubroom, a pre-fabricated building with a toilet, a changing room, a kitchen area and a seating area. It looked and sounded wonderful, but we would need money for it and all the equipment. The search was on for grants and Neil and John Small managed to obtain three – £5000 from the Croquet Association for equipment, a Sport England small grant of £10,000 for more equipment and a major award of nearly £43,000 from Sport England ‘Places People Play’ scheme for a new clubroom and all the construction needed for this. 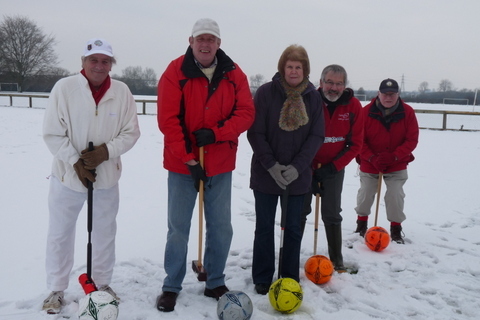 We celebrated the news with croquet in the snow! The clubhouse needed to be fitted out and we used some of our reserve funds to buy a fridge, a kettle, a boiler, and all the cutlery and crockery needed for match teas and other social events. By the start of the season nearly everything was completed and we were so relieved to be able to get inside away from the bitterly cold winds that sweep across our Lawns. A Grand Opening Ceremony was arranged and Quiller Barrett, President of the CA, Mick Bray, Mayor of Swindon, Justin Tomlinson, MP for North Swindon all attended and said a few words. As the ribbon was cut, Quiller revealed that club members had decided to name the clubroom ‘The John Airey Clubroom’ after our secretary and Chief Coach John Airey who has been the guiding light for the club in all its community work and competitive play for many years. The next day we held an Open Day to show the general public what we had achieved and the MP had enjoyed his time with us so much he came back with friends! But that’s not quite the end of the story. We have our lovely new clubroom but we are in a very exposed spot and the night after the Opening ceremony the old Green Room was broken into. Nothing was taken except a petrol can but we had to review our security systems. We have now expanded to three full Lawns and to put a secure fence around everything. We are expecting to expand to six lawns and more facilities with the planned Moredon Sports Hub over the next couple of years. So watch this space as the story continues…..